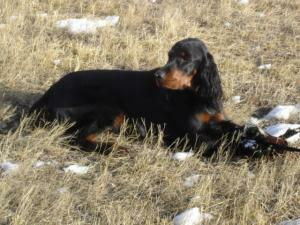 Tonka is doing wonderfully in her show career with Marjo Tuamola at Xeneran Kennels. We wish them continued sucess. 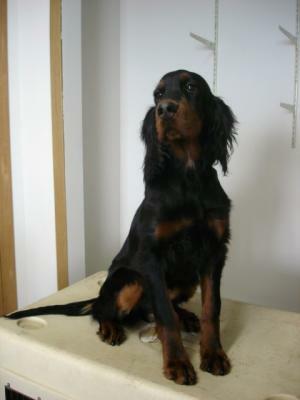 Tonka is doing us proud in Finland and is an International Champion, receiving her fourth CACIB in July 2011. We said a fond fairwell to Tonka February 2009. Tonka made the trip from Calgary to Helsinki stopping overnight in Frankfurt. 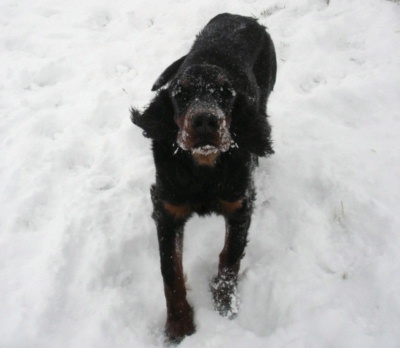 Tonka is now residing at Xenaran Kennels owed by Marjo Tuomola. Marjo tells me that Tonka has settled in very well and is enjoying the company of her new Gordon and Irish friends. Tonka is learning a few words of Finish, but Marjo tells me that Tonka uses the language barrier to her benefit and pretends not to understand if she doesn't want to do what she is asked. Tonka also made the trip to PA this September. She wasn't entered in the National as her birthday fell at a bad time putting her in the 12-18 class by one day. Consequently she was entered in Brandywine and Bucks County. However, I made a mess of the entry putting her birthday down dd/mm/yy rather than mm/dd/yy. So she was in the wrong class. Rau did sort it out for us, but we ended up being the only entry in the 9-12. Nice ribbons but no points, but good experience for our little terror. Tonka may look sweet and innocent, but that's just a front. She takes delight in charging at you full tilt and leaping up. No matter how many times you tell her four on the floor she will always give it one more go. When you think you have won that battle, she comes at you from behind and gets you between the shoulders. When you turn to tell her off she's sitting ever so sweetly like butter wouldn't melt in her mouth. Tonka loves to play keepaway with Roz and whoever else will chase her. She's very athletic and can twist and turn on a dime. Tables and tents present no problems to her, she has figured out how easy tables are to jump on and that mesh screens are no problem to run through. Between Roz and Tonka they just about redesigned Jani's backyard. To Ronan's dismay they found all his hidden treasures, played with them ate them and showed no respect for their great Uncle. Tonka enjoyed playing in the Atlantic and climbing the rocks at Kings Head Beach. Although she sounds like she can be awful, Tonka is one of the sweetest girls who loves to cuddle. She's as smart as a whip though. Tonka took an unexpected dunk in the river today. Instead of letting us introduce her slowly to the river, ever inquisitive she took off on her own along the river bank. I don't really know what happened as I was helping Roz out of her crate, but turned in time to see Tonka's head pop up from under the water and paws moving quickly to get her back on land. A little cautious for all of ten seconds Tonka came back to the group and started to paddle in the shallows, watching her friends Tyrone and Sophie swimming after the decoy duck and the bumper. Not one to stand and watch for long Tonka was soon retrieving the dummy and bumper from the shallows. At one point she had us all laughing by leaping high in the air to 'attack' the duck in the water, which was a little deeper than she thought. Fun to watch puppies taking first steps at new activities I am sure by the end of summer we will have a very capable swimmer on hand. Tonka makes her debut at a conformation match, taking the Sporting Group and Reserve in Match. I'm not really sure how to describe Tonka other than she is like the tazmanian devil, a whirlwind wherever she is. Tonka tries very hard with her sits and settles, but finds the tip of her tail just sets the rest of her body vibrating. Tonka loves to race around the paddock with Edward, each morning she glues herself to his shoulder and away they go, two circuits of the five acres before breaking away to attend to personal business. Tonka does everything at warp speed, total opposite to Roz her side kick. The two girls are lots of fun to have around and complement each other nicely. Tonka is a keeper from our last litter in September 2007. 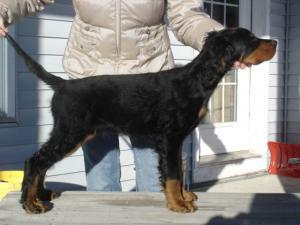 At a very early age she showed lots of bone and substance, earing her the name of Tonka, as she is built like a truck. Although her call name is not what you would expect for a girl Tonka is very obviously one. A sunny nature, she treats the house and hallway like a racetrack, eats like there is no tomorrow. A typical Sassenach puppy. Tonka spends her days hanging out with cousin Rozamund. The two of them get up to all kinds of puppy things both in and out of the house. although I am not sure which of Tonka's parents she takes after the most the eyes closed is very definately a Lillie shot. I love her short back and long ears. It's hard to tell in the stacked picture as a bit of a strangle hold is needed to keep her still long enough for a picture.